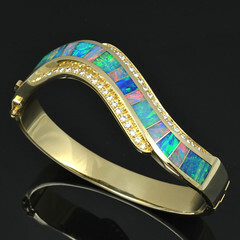 Many customers stumble on to our silver jewelry website and don’t realize that we also make gold jewelry. All of the sterling silver jewelry you see on our Hileman Silver Jewelry website, including our popular dinosaur bone rings and turquoise engagement rings, can be ordered in 14 karat white or yellow gold. We also work in stainless steel, platinum and rose gold. Sterling silver is the softest of all the precious metals so we recommend that you upgrade to 14k gold for added durability if your budget allows. Gold will hold up better for daily wear and will provide a more secure setting for your gemstones. If your budget doesn’t allow for gold, you should consider upgrading from standard sterling silver to Continuum silver for some added durability and tarnish resistance. Because gold prices fluctuate and larger ring sizes require more gold, we don’t have prices for 14k gold upgrades shown on our silver jewelry website. Contact us with your ring size and we will give you a price to upgrade to white or yellow gold, rose gold or platinum. Here are some examples of our ring designs in upgraded metals. This turquoise engagement ring is one of our most popular engagement rings in sterling silver but is even more stunning in 14 karat gold. 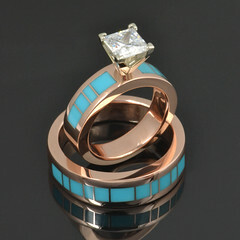 Turquoise engagement ring with .70 carat Moissanite set in 14 karat yellow gold by Hileman Silver Jewelry. 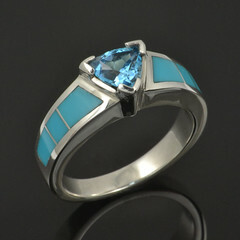 Here is a great example of turquoise inlaid in 14 karat rose gold. This was a special order ring and the first ring we have made with turquoise and rose gold together. What do you think? Rose gold turquoise wedding band by Hileman Silver Jewelry. Yes, we work in rose gold as well as white and yellow gold! Contact us with your ring size or sizes for a price quote to upgrade your favorite jewelry design to 14k gold or platinum. All of our ring designs are made to order in your specific ring size so please allow us 4 to 6 weeks to make your new ring. Call us with questions at (623) 518-6588.